About Rock Village Hall. Bewdley, Kidderminster, Worcestershire. Enchanting Wedding Receptions, Conferences, and Meetings. The committee is made up of volunteers who live in and around the village of Rock. The volunteers work together to ensure that the Rock Village Hall and millennium green is a superb facility for the local community to use. The committee has various functions but the main aim is to ensure that the hall is maintained to a good standard and there are sufficient funds to enable them to do this. The committee has divided into sub groups who share the various tasks as shown below. The committee meets the last Monday of each month at 7.30pm in the small meeting room The Annual General Meeting is held each November and is combined with an open forum for anyone to attend to share their comments and ideas. 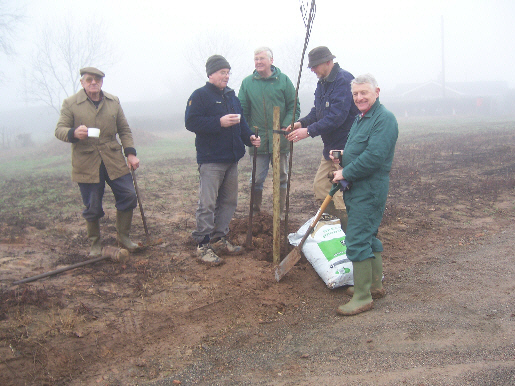 Volunteers on a very cold tree planting day!